Peace is not aspired by everyone in Colombia, despite the fact that the country is living in historic times to bring its civil war to an end, which has caused more than 220,000 deaths and 6,864,934 victims (mostly displaced people). In fact, the debate about peace is an ideological battle between the left and the right. Many armed actors are involved in violence, intimidation and in drug trafficking. However, the ideological view usually allows just a limited perspective one has on the conflict. The ideological battle starts with framing the violence: the Colombian left is talking about armed conflict, and in particular about the crimes of paramilitary organizations, the bacrims and the Colombian army, while the right is talking about a terrorist threat caused by the left-wing guerrillas, in particular the FARC and the ELN, which attack innocent civilians and are responsible for drug trafficking. In fact, all the actors mentioned are responsible for the continued violence in the last remaining armed conflict in the western hemisphere, and one of the longest ongoing civil wars in the world. Colombian president Santos was elected with the promise to make peace with the FARC. In June 2014, Juan Manuel Santos, a center-right opportunist won the presidential elections with the promise to reach a negotiated peace agreement with the FARC. The incumbent had a hard time to be re-elected and came in only second in the first round behind the candidate of the far right that strongly spoke out against negotiations with the guerilla but promised to pursue a purely military approach against the FARC. The second round of the presidential elections was all about the peace process that divided the country in two parts. Santos won the second round with 51% against his opponent Óscar Iván Zuluaga from the Democratic Center, the party of former president Álvaro Uribe who is the archenemy of Santos. Ever since this vote, the country remains split: there is about one half of the population who is with Santos (or at least see in him the lesser evil), and those who are against him (and quite profoundly so). This deep political rift is very much related to the question whether or not a peace deal with the FARC should be reached. Many (wealthy) Colombians are not ready to forgive what the FARC has done to them. That is related to personal experiences but also to the fact, that the media is mostly reporting about the crimes of the FARC while the attacks of (neo)paramilitaries and the state are often falling under the table of media attention; maybe because paramilitares and organized crime are attacking the poorest parts of society to take away their lands to use it for agro-industrial or mining purposes. A lot of Colombians are still traumatized by the disaster of the last round of peace talks (1999-2002) under president Andrés Pastrana, which ended in a total disaster. The FARC used a demilitarized zone to get more power than ever since its insurgency in 1964 and was in fact not anymore a guerilla but a standing army. During this time, the FARC committed many attacks on civilian targets, and committed the infamous pescas miligrosas (kidnappings). It should not be forgotten though that around the same time also the Colombian armed forces experienced the start of enormous growth: the heinous Plan Colombia started to be implemented – U.S. military aid worth more than $9bn (!) was given to Colombia during the past 15 years in its global “war against drugs.” While officially used against coca plantations, it was often used for severe human rights abuses. This time around, everything should be different. When Santos was elected the first time president in 2010, he surprisingly started peace talks with the FARC in Norway in 2012. These talks continued in Havana, Cuba, with an agenda of six points whereby on three points (agricultural reform, political participation and drugs) preliminary agreement has been reached by now. No one can be a 100% sure, but it might probably take just a couple of other months before a final peace agreement can be signed. Little time in comparison to armed violence of 50 years. 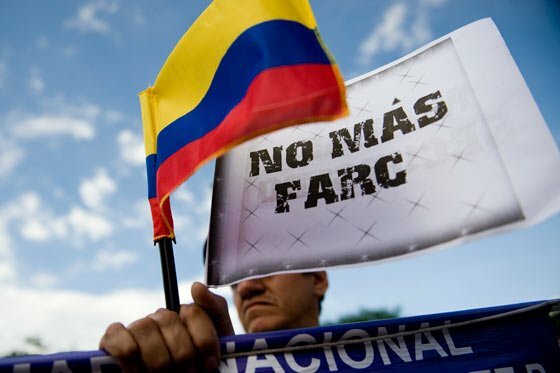 In contrast to the last round of peace talks, the Colombian government refuses categorically to have any ceasefire with the FARC and continues to kill their members. A fact that many Colombians often seem to forget in discussions because after each attack of the FARC during the current peace negotiations on Cuba causes an outcry and everyone starts to question from anew whether peace negotiations make sense. These destructive debates will make it harder to reintegrate former FARC members during the implementation of a possible peace agreement. By now, success of the peace talks seems to be very much likely. This should allow for the re-integration of the FARC in society. However, many people on the right argue that the FARC should be wiped out by military means as it happened under president Uribe (although also Santos continued to hunt the FARC militarily as well). Quite shockingly, these people from the (far) right ignore that under Uribe multiple innocent people were killed and later dressed in FARC uniforms to show their “success” in the battle against the guerrilla group – the infamous falsos positivos. One of the major problems within the Colombian discussion is that the conflict is seen from a very emotional point of view. That does not come as a surprise, considering that basically everyone’s family has been somehow affected during the 50 years of civil war. The divide of who is responsible for the violence is almost never neutral, not even necessarily in an academic context. And there it gets highly problematic. For right-wing people, Colombia can only move on when the FARC doesn’t exist anymore – implicitly by killing them militarily. For the majority of people it is clear who is responsible for the violence: it is the guerrilla or the paramilitary and the state that are responsible for the violence and the big mess that it causes. Similarly to the Middle East conflict where there are hardly people out there who can still have a somewhat objective view of what is going on, also in Colombia the lines are deeply entrenched, whereby the big majority of people in between does not care. It is mostly the people on the left that cry out for peace, whereby they always imply that the structural violence of the state needs to be addressed at once as well. These demands are often framed in ideological and Marxist terms to win more rights for the smallholder farmers. Surely, the Colombian state has failed on a continued basis since more than two centuries to serve everyone in the country on an equal basis. Thus, in the same country one can experience “Western” standards in the majority of the big cities while at the same time there are parts at the periphery where people live in extreme poverty. Addressing the social question has always been on the forefront of the leftist guerrillas, although in the meantime they seem to be much more busy to be involved in other activities, not least in the narco-business. However, solving issues of social injustice need first an end of the armed conflict so that the Colombian state will finally cut down its enormous military expenses that officially is just 3.4% (according to World Bank data) although in fact Colombia spends 14% (!) of its national budget on security for 2014. That is a lot of money that could be spent for other sectors and could be used to improve the very low standards of public education and health, as well as other vital infrastructure in the country. This “peace dividend” would be necessary to further combat extreme poverty and diversify the Colombian economy that during the past 15 years depends again highly on commodities while missing out on industry and a rather under-developed service industry. 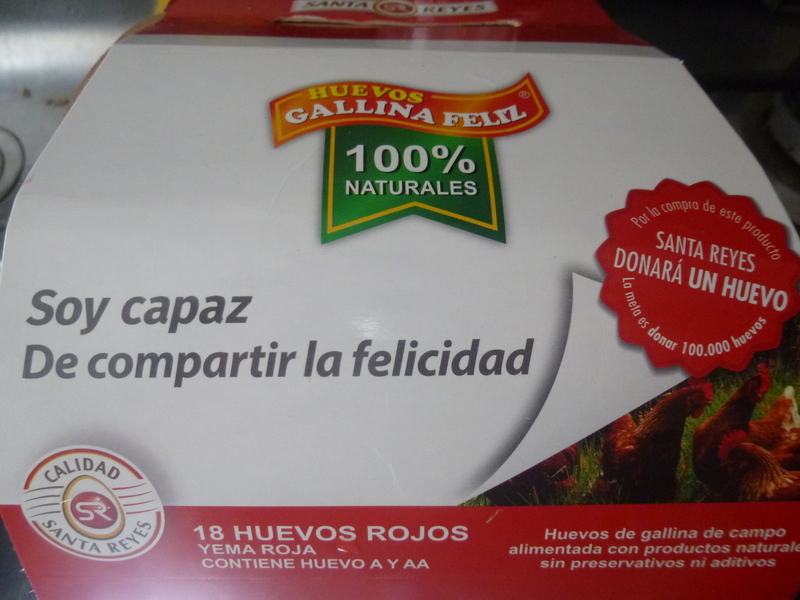 Many companies in Colombia publish on their products of what they are capable of – like on the package of these eggs – in order to promote a positive atmosphere for peace. 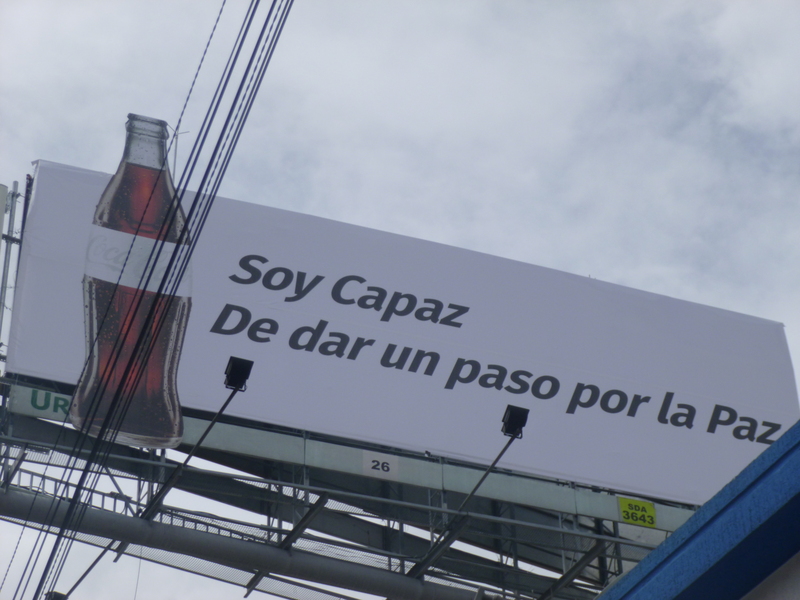 Since the beginning of September 2014, some 120 companies (among them also foreign multinationals like Coca Cola and McDonalds) have started a campaign to speak out with #SoyCapaz (I am capable of). These companies have huge billboards around the country with different slogans of what one is capable of, and include that on their products as well. Also the big media outlets (including TV, radio and newspapers) are supporting the campaign. 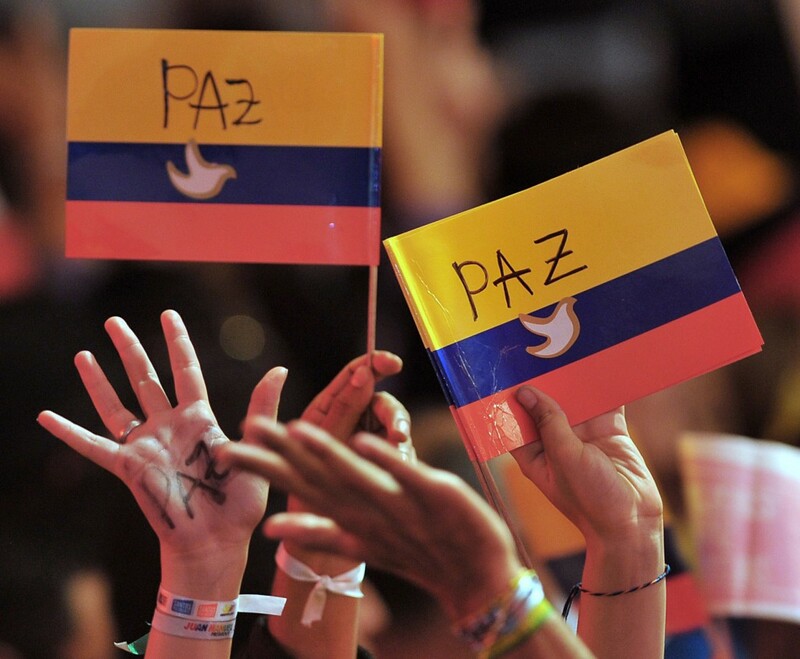 Clearly, they are playing with the word capaz, because the word paz (peace) is included. The campaign should help to forgive, to respect differences – whereby one should start with oneself. Importantly, this campaign is not supported financially by the state and thus is a sign that there is a broader will out there to reach peace. While the extreme right around Uribe attacks this campaign, many people involve themselves and I would see it as a chance to win over many people for peace, starting with themselves. One of the challenges would be that these companies should continue their support for peace also when a potential peace agreement will be implemented: to help the transition and to make a negative peace to a positive one. Everyone will need to make her or his contribution for change in Colombia. That would also include the Colombian left that hopefully will realize soon that the Cold War is over and we live in a post-ideological world. I love your way of writing.